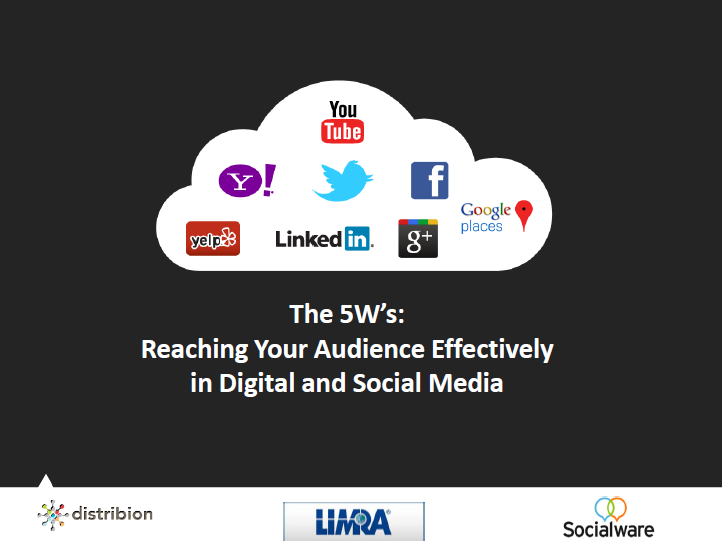 Today’s webcast was a success, and I learned a lot from Socialware’s Christie Campbell and LIMRA’s Stephen Selby — as usual. Digital Influence: Who has it & how do you get it? Are you talking at your audience – or with them? Sign up here for an invitation to future webinars in this ongoing series. The recording is now available to view on demand by clicking here. The presentation, which includes additional details, links, and speaker’s notes, is now available for download by clicking here. Gallery | This entry was posted in Uncategorized and tagged Deb McAlister, Distribion, email marketing, Facebook, Google, LIMRA, LinkedIn, multi-channel marketing, social media, social media marketing, Socialware, Twitter. Bookmark the permalink.